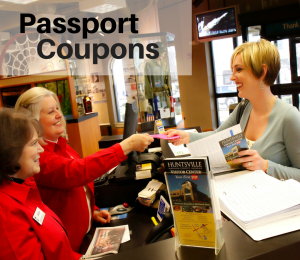 Download the Holiday Magic Pass for discounts to select activities! 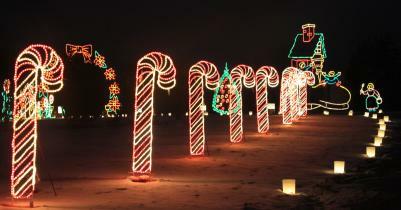 Join the tradition of this winter light extravaganza with thousands of twinkling lights and animated displays. Enjoy the lights in a variety of ways, including Walking Nights, Dog Nights, the Galaxy of Lights 5K and Holiday Dash 3K, and Bike the Lights! Young and young-at-heart will delight in visiting Santa & Mrs. Claus&apos;s home, the reindeer in their stable and elves in their toy shop. Create special memories for you and your family in the village Santa calls home. The Twickenham District will be aglow with luminaries, trees & front doors glistening with holiday decorations and carolers strolling along the way. A festive display of live Christmas trees in downtown Huntsville decorated by individuals, non-profits and corporations. Located in Big Spring Park. Grab your friends, family and skates then head downtown to enjoy outdoor ice skating behind the Museum. Admission charged and rental skates available. The star-lit mountain will be mirrored by more than 600 flickering candles, adding to the dreamy, nostalgic feel of Candlelight Christmas. You&apos;ll find music everywhere on the Mountain. Cider, cookies and tasty figgy pudding will warm you up. Ride with Santa, gifts for the children & candy canes for everyone. Take the museum&apos;s free walking tour. See historic railroad equipment & the Chase Depot. The train will operate rain or shine. 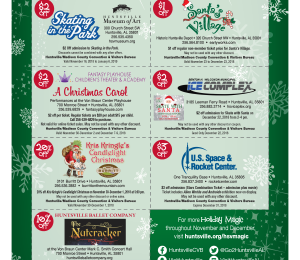 Huntsville&apos;s Annual Christmas Parade will be Tuesday, December 4th starting at 6:00 pm. Staging and line up at Lot K on Clinton Avenue. Proceeds left onto Monroe Street, right on Greene Street, left on Williams Avenue and right onto Adams Street. Madison&apos;s Annual Christmas Parade will be Saturday, December 8, starting at 5:30 pm. The Parade route will begin at Hughes Road and Plaza Drive and will continue to downtown Madison. Revisit holidays past with classic performances such as "The Nutcracker" December 7, 8, and 9 at the Mark C. Smith Concert Hall and "A Christmas Carol" November 30 - December 2 and December 7-9 at the Von Braun Center or visit theatres like Merrimack Hall or Renaissance Theatre. Savor a delicious meal with family and friends at one of our area&apos;s exclusive restaurants. Pause to listen to a children&apos;s choir at one of our many shopping centers. Huntsville Museum of Art, and more to tour special exhibitions.